Today was just like every other day for me. The sun peeked out from behind the curtains earlier than I wanted as I threw my arm over to my phone to turn off my alarm. Out of the bed I stumbled to go and wake the kids for school. After the early morning drop off, I’m back at home going through my memory box of scriptures where I set time aside to meditate on scriptures the Lord has given me to memorize. It has been quite an adventure with these verse and passages of scripture, learning the melodious way they flow through my lips and into my heart. This morning as I was going through them, one seem to jump out at me for the day’s challenge and so I set it aside. I was a bit unenthusiastic on leaving this particular scripture because it just seemed different from all the rest that I have left…kind of like the Acts 4:12 “Salvation is found in no one else. There is no other name, under heaven, given to men, by which we must be saved.” Once I was finally through my morning routine of my quiet time, I wrote out the scripture on an index card, prayed to be able to set it up to leave with someone that day when I was given the opportunity. That opportunity came when my phone rang and was asked to bring something up to the restaurant that my husband forgot. On my way there, I realized I was low on gas and quickly made the decision to go to Sam’s and not wait like I normally do, hoping their prices would be the lowest around town. I wasn’t even really thinking about leaving an index card at this point in my day. I thought once I got to the restaurant, there would be a better opportunity to pray and wait. When I entered the parking lot at Sam’s, I made my way back to where they sell gas and came up on a woman wearing a hijab, getting out of the passenger seat of a car. Immediately, the index card came to mind and I slowed down to make like I was going to park. I found a spot right in front of them and watched her husband help their little girl out of the back seat. As I watched the three of them head into Sam’s I kept arguing with the Lord. “This can’t be the scripture you want me to leave with someone who may be Muslim. Wouldn’t Acts 4:12 be better for this situation?” I even tried to find paper in my van to re-write the index card, but to no avail. Four children and not one single piece of paper in my van, really? 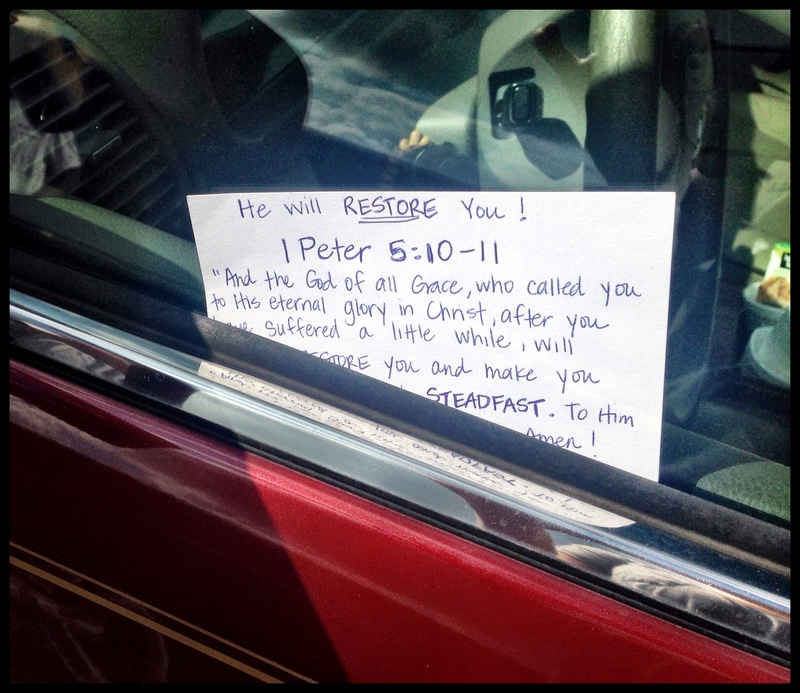 As I carried on with my “I know better than you, God” attitude, looking for a piece of paper, three men decided to have a reunion right beside the driver side window of where I would leave the index card. I just sat there, shaking my head, thinking this obviously isn’t who He wants me to leave this card with. I literally sat there trying to justify why I shouldn’t leave this passage of scripture and why that wasn’t the car I was to leave it at. The more I wrestled with not leaving this specific scripture with this specific person, the more the Holy Spirit convicted me of my disobedient, self-righteous, attitude. I knew there was no way the Lord was going to let me leave this parking lot without leaving this index card on their window. I knew it was a losing battle for myself. So, without any more hesitation, I got out of my van and walked towards the three men. They curiously looked my way, and became a bit quieter in their conversation. I politely said good afternoon as I attempted to slide the index card in between the window. By then, they had completely stopped talking at this point to see what I was doing. I turned my head towards them and smiled seeing they were all just staring at me, yet trying to act like they weren’t paying attention. It was quite hilarious to say the least. One of the gentlemen began putting his groceries in his trunk as I heard the other man say “Well, I guess we’ll be going. Good luck in the car business.” Once I made sure the index card was firmly situated, I glanced at the gentlemen putting his groceries in his trunk and said “Just moving the gospel, hope you have a nice afternoon.” I walked back to my van and jumped in. I sat there, praying for His Word to accomplish the purposes He intended it for and then headed off to fill my van up with gas.